My life as a mosquito magnet. I do not know how many times I have served as a mosquito magnet when walking, taking a swim at dusk, or attending garden parties - just everywhere - much to the delight of others present. It’s the same story with my dad, and even my daughter has been suffering from mosquito bites since she was born. At least my sense of humor has remained, and I can laugh along with the others. Since I have started working at Biogents, I now know we neither are that sweet at all nor does our blood taste sweeter than that of other people. We just smell very “appetizing” for mosquitoes; ever since someone had held a freshly opened package of our artificial skin scent BG-Sweetscent under my nose, I now believe even more that we humans just plain stink. Even after we have just showered and have the nice fruity scent of our shower gel, mosquitoes are magically drawn to us. Dinner is served – sort of! It is at least comforting to know that we can’t do much about it, no matter how often we shower. The only real rival is: the Biogents BG-Sweetscent! Mosquitoes find the BG-Sweetscent simply irresistible even in the small quantities in which it is dispensed by our mosquito trap BG-Mosquitaire CO2 in the garden air. Luckily, these small quantities are unnoticeable for people! However, the mosquitoes really enjoy it and fly straight into the mosquito trap. What smells so good? It’s not the jeans, but the genes…and beer. The skin odor of a human consists of several components. Some of them, such as lactic acid, ammonia, and fatty acids, are exceptionally attractive for mosquitoes. One of the Biogents founders, Dr. Martin Geier, spent over 16 years researching this topic specifically and even wrote his dissertation on mosquito behavior and the human scent. From his research, Biogents was able to receive a patent for the specially formulated BG-Sweetcsent. Lactic acid, the main component of the BG-Sweetscent, is known to be a good mosquito attractant and is actually produced by bacteria that is naturally found on human skin. Everyone has a different bacterial flora, but typically, the more a person sweats, the more bacteria there is on the skin and the more lactic acid can be produced by the bacteria. Generally speaking, mosquitoes tend to like sweaty people. On a side note, mosquitoes are extremely attracted to foot sweat which is where a lot of bacteria can be found. Have you ever noticed that mosquitoes love to bite around the feet and the ankles? For example, researchers actually use worn socks as attractants in the BG-Sentinel trap, which is Biogents’ mosquito trap for researchers and monitoring programs. It works with the same trapping principle as the BG-Mosquitaire CO2. Genes are (partly) to blame, too, for our attractiveness to our “little friends” since the individual human skin odor is affected by them. Depending on each person’s specific genetic makeup, some people indeed smell much more irresistible than others. Mosquitoes have such a sensitive and precise sense of smell that they can accurately choose the very best treat from the richly – with humans – set table. 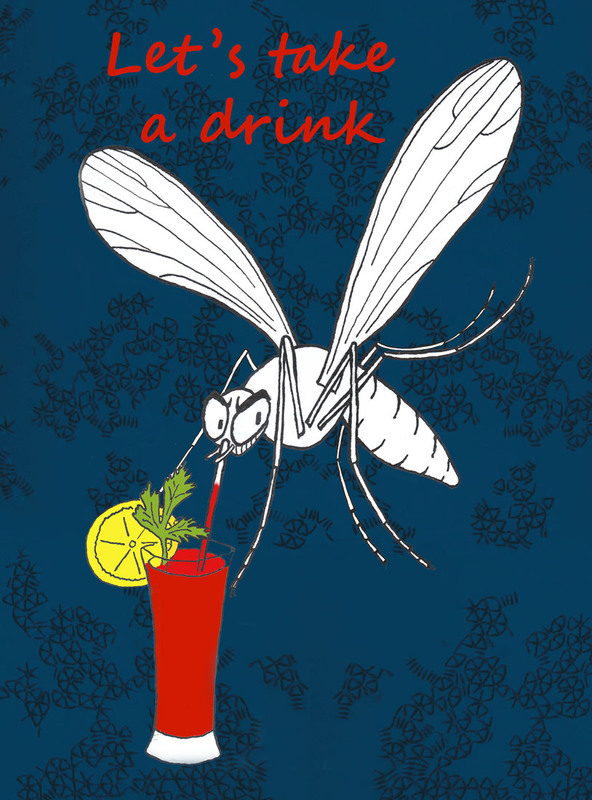 In addition, if you have blood type O and you drink a beer at a BBQ, then our beloved mosquitoes have hit the jackpot. Blood types AB and B are OK for mosquitoes, and people with blood type A may partly rejoice as, according to a scientific study, they are less attractive for mosquitoes, at least for tiger mosquitoes. Unfortunately, though, these rules do not seem to apply to me or at least the domestic mosquito species we have here since I have blood type A, I rarely drink beer and being a woman, I obviously never sweat. Perhaps I am just the exception. Battle of the titans: human vs. mosquito. 3. Set a Biogents mosquito trap BG-Mosquitaire CO2 in your garden to catch the mosquitoes before they find their way to you. Fight the bite – despite your “sweet blood” – completely without chemicals! For several years now, we have been running a mosquito trap with a CO2 bottle in our garden from the start of the mosquito season (when temperatures start reaching over 60° F). And what shall I say? It helps! The BG-Mosquitaire CO2 simply catches the mosquitoes in our garden before our ”appetizing” smell reaches their nose. Now and again a pesky mosquito still reaches us when sitting outside on the terrace, but compared to before, it’s a night and day difference. When they do make it past the BG-Mosquitaire trap, they experience our manual mosquito defense system: a swat of the hand in that case, which can be quite appeasing. Having the BG-Mosquitaire mosquito trap in our garden is the best choice for eco-friendly and beneficial-insect-friendly mosquito control – without any poisonous pesticides – and really brings great relief to our mosquito magnetic family!